Photo by Robert Levy, Flickr. Summer solstice has came and went and August is the time of the season to wet lines and soak up the warmest weather of the year. While some might think that the best fishing spots on the river and the salt require a boat and plenty of money for gas, we are here to prove that misconception all wrong. These walk-in fishing spots are easily accessible, they offer spectacular scenery and best of all – all they require is for you to show up with a rod in hand. Low maintenance and easy on the wallet, for those of you that love catching deliciously wild Alaska seafood – it doesn’t get much better than these hot spots and best kept secrets on The Kenai, Alaska’s Playground. While these spots are all phenomenal in their own ways, keep in mind there are tons more great spots to walk-in and wet a line all throughout The Kenai, Alaska’s Playground. But we figured that this will give you a good introduction for now. For the fly fishers in the crowd THIS article is a great read and documents some great spots to walk-in and wet a line. If you’d like any more tips for great spots or need help finding any of the above that we’ve listed, feel free to give us a call or shoot us an email and we will help in anyway that we can! This footage of Homer based surfer and photographer, Scott Dickerson will make you completely fall in love with surfing on The Kenai, Alaska’s Playground. His perspective on appreciating the simplicity of life and his tenacity to brave the cold Alaskan waters is incredibly admirable. As he talks about one of the most glorious parts of surfing in Alaska being that there aren’t the crazy crowds on the water (like what you might experience in places like Hawaii), we can’t help but to relate. We love Alaska’s Playground for many, many undeniable reasons but probably more so that anything, the ability to find our own private pieces of paradise – sans the crowds – is what really makes our hearts skip a beat. There is nothing like the feeling of getting up close and personal with nature while experience the sounds of, well – nothing. The hustle and bustle of the city is just not for us. We are outdoor lovers with a passion for all things natural and pristine. And if we can experience Alaska’s many mountains, glaciers and wildlife while doing fun water sports such as surfing, why the heck wouldn’t we? Life is too short to be bored and as the saying goes… you can get busy living or you can get busy dying. And on that note, it’s time for us to go home and go play! Would you ever try surfing on Alaska’s Playground? The folks at Surf Alaska in Homer are experts at documenting the true beauty of this sport. Be sure to check them out! You might have remembered the baby moose that was born recently in the Lowe’s parking lot in Alaska. Talk about an “Only in Alaska” moment. So special. This baby moose wobbling around and learning how to walk in Homer on the Kenai Peninsula is way too cute for words. So lovable, huggable and kissable! From just over a month ago in Alaska is this fantastic video (with great music) of a baby moose playing in someone’s yard as mama watches on. It’s happy, innocent and filled with so much joy. And last but not least there is this truly miraculous video of a mama moose lying down on a yard in Alaska and giving birth to twins. It shows the actual birth (which is slightly graphic to some) but it’s one of the most beautiful displays of nature that you will probably ever witness. Watch as the newborn moose stumble and wobble to get up and use their legs for the first time ever. That’s all for now! ❤ Do you have any video footage of wildlife on The Kenai, Alaska’s Playground that you’ve taken? If so, be sure to share it with us in the comments below because we would LOVE to see it! Happy first day of July! With the 4th of July weekend officially upon us, we figured that there is no greater way to celebrate our independence than to leave the noise of the city behind us and disappear into the woods for a lofty dose of nature cleansing. 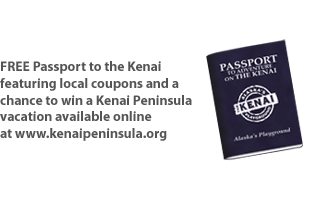 For all over you adventure travelers that are visiting The Kenai, Alaska’s Playground this summer, we have the perfect idea for you to get the most out of every step of your epic journey. First things first; You must rummage your closet for some ultra-durable wicking layers of clothing, get a handful of MRE meals and some delicious dried fruit, grab a light yet comfortable sleeping pad, a warm sleeping bag, a can of bear spray, a few bottles of bug spray and a durable tent with a good rain fly. Okay, now you are ready to rock and roll in the backcountry. Backpacking is the best way to get up close and personal with the real, raw Alaska that locals love. If you want to get up close and personal with stoic wildlife, booming mountains, glistening glaciers and abundant fishing streams – this is the activity for you. Round up some of your best friends or your special someone and hit the ground running. The 6,908,540 acre Chugach National Forest and the 1.92 million acre Kenai National Wildlife Refuge are just a couple of the excellent areas that are perfect for all of your beloved backpacking adventures. And if tent camping isn’t really your thing, keep in mind that there are tons of state cabins all throughout these great places that are available for a very small fee (with reservations required). Be safe and have fun out there this weekend and all summer long. Happiness only real when shared. ❤ Don’t go into the backcountry alone unless you’ve told close friends or family exactly where you are going and where your daily routes are going to lead you. Are you as obsessed with the outdoors as we are? Check out this article which features great camping spots all over The Kenai, Alaska’s Playground.